In this Oct. 26, 2018, file photo, Housing and Urban Development Secretary Ben Carson speaks at the 2018 Young Black Leadership Summit at the White House in Washington. Maine’s senior senator will host another Cabinet member in Maine today. 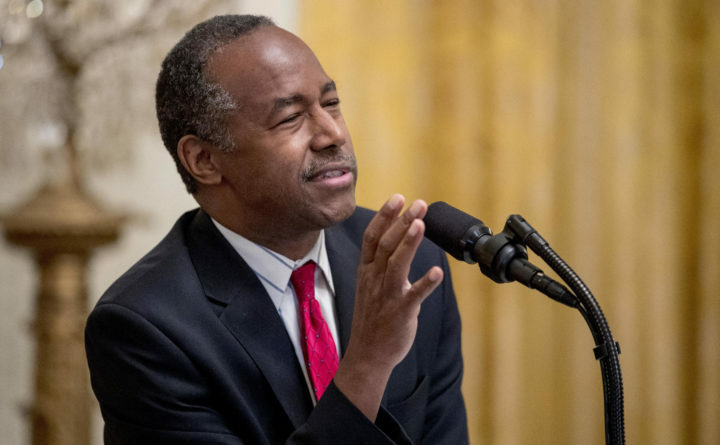 U.S. Sen. Susan Collins and Housing and Urban Development Secretary Ben Carson will eat breakfast together, then tour a youth center and transitional housing program in Lewiston before holding a media availability in the afternoon. Carson, who unsuccessfully ran for president in the 2016 Republican primary, has been one of President Donald Trump’s less controversial and long-tenured Cabinet members, although he said in January that he would step down from the post if Trump wins a second term. Collins, who was in Florida earlier this week for a fundraiser, has yet to say whether she will seek a fifth term in 2020. But hosting Carson in Maine’s second-largest city, which has become somewhat of a bellwether for statewide elections in recent years after decades of solid Democratic support, can’t help but remind people there of her influence with the administration and ability to keep a steady flow of federal money to Maine.